Briskheat flexible fiberglass heating tape, ideal for High-temperature heating needs. This multi-stranded resistance wire heating element provides exceptional flexibility and durability with rapid thermal response provides accurate heat. 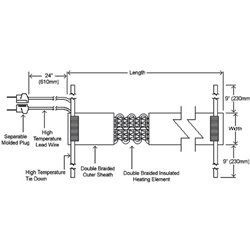 Our fiberglass heat trace is available in a wide variety of length and width configuration options (below); with built-in split-plug design easily connects to your choice of temperature controlling device. Maximum exposure temperatures up to 900°F (482°C).